PBF Energy, owner of the Torrance Refinery, was fined $150,000 this month for storing hazardous waste without proper permits. The refinery is already under pressure from neighbors, environmentalists and air quality regulators to limit its use of a toxic chemical that could harm thousands of people if released. The fine adds to the refinery's troubles, and calls into question PBF Energy officials' repeated assertions at community meetings that safe operations and compliance with legal standards come first. Imagine one of those truck-mounted roll-off storage bins — 22 feet long, 7 feet wide — more than 300 of them, all full of containers of hazardous sludge. That's what a team of inspectors from the U.S. Environmental Protection Agency and the California Department of Toxic Substances Control (DTSC) found at the Torrance Refinery back in December 2016. The sludge was waste from refining operations, including slop oil emulsion solids, and crude oil storage tank sediments. SOUNDS NASTY, BUT IT'S A REFINERY. WHAT'S THE BIG DEAL? The material was being stored without a permit, in violation of state regulations, and the refinery had no means of recycling it or disposing of it on site. It's a new black mark for a refinery that is struggling to continue doing business in a community that has become skeptical of the company's assurances that it is a safe neighbor. 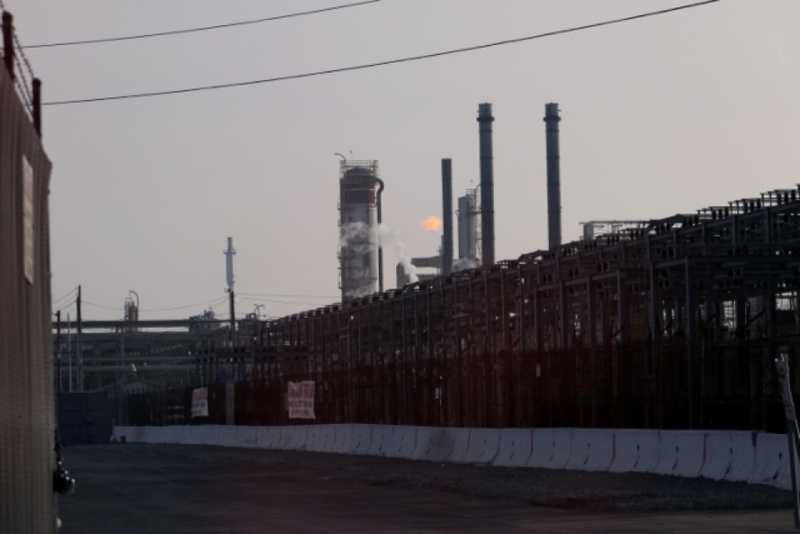 "Whenever I hear from PBF representatives the first thing they say is safety is job one," said Jerry O'Connor, of the Torrance Refinery Action Alliance. But a revelation like the illegally stored waste makes him not trust the company's words. "Not only do they disobey their federal standards," O'Connor said. "They give public testimony that safety is important when their practices prove the exact opposite." Sally Hayati, president of the Torrance Refinery Action Alliance said, "It costs less to pay the fine than to dispose of those materials safely." HOW DID THE WASTE GET THERE? The sludge and sediments are what was cleaned out of tanks at the refinery both before and after the February 2015 explosion under former owner Exxon-Mobil. It also continued to accumulate after the sale of the refinery to the current owner, according to PBF Energy spokeswoman Gesunia Paras. PBF Energy added to the stockpile as late as 2017, Paras said in an emailed statement. The waste was stored in leak-tight containers with lids and it is inspected every week to make sure there are no leaks, Paras said. It was held at dedicated storage areas. "Because of those steps, she said, the bins of waste "do not present a risk to refinery workers or the community," Paras said. WHAT'S THE REFINERY SUPPOSED TO DO WITH THE WASTE? In March, the refinery got an order from the DTSC to remove it. In April, the EPA turned enforcement of the hazardous waste fine over to the state DTSC to handle. A follow-up order containing the $150,000 fine was issued this week. The fine resulted from negotiations between DTSC and PBF Energy, representatives of both said. PBF Energy agreed to the fine to avoid costly litigation and to speed a resolution. Torrance Refinery agrees to meet a series of deadlines to get rid of the waste by the end of the year. If it misses any of the targets, it could be fined an additional $6,000 per bin. BUT TORRANCE REFINERY'S GOT OTHER PROBLEMS, RIGHT? In February 2015, a big explosion at the facility — then owned by Exxon-Mobil — sent a massive chunk of metal into the air. That debris landed just feet from a tank containing deadly hydrofluoric acid. The chemical is especially dangerous because if it is exposed to air, it can vaporize and create a toxic ground-hugging cloud that can move along for miles, injuring or killing those in its path. The South Coast Air Quality Management Committee has been holding hearings aimed at minimizing the hazard from hydrofluoric acid, possibly through very costly changes in the refinery's equipment, or possibly through an outright ban. A decision from the AQMD board could come later this year. The company has also been fined over its emissions, especially ones coming from the refinery after power outages, when excess hydrocarbons in the refinery are burned off by an open flare.